Some of you may have noticed that I have added a few new buttons, badges, and links to my side bar. I'm thrilled to announce that I'm now part of the Accuquilt Go! Baby blogger incentive program. 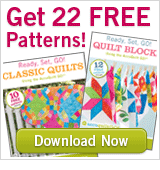 You may have seen tutorials and reviews for the Accuquilt Go! Baby around blog land, pretty soon I'll be joining in on the fun. If you haven't yet heard about the Accuquilt Go! die cutting machines, make sure that you hop on over to their website and see all that they have to offer. I've had mine a little over a week, and I love it. I'm excited to share some projects that I'm working on with you. Feel free to click on the image above to receive 22 free patterns just for subscribing by email. I've also added a new Flickr button, and a Pinterest one as well. You can follow the Flickr button to my new public flickr group. It's empty now, but I'd love for any of you that have tried out my tutorials, or been inspired by any of my projects, to add some images of your finished projects. I'd love to feature some of flickr favorites here on the blog. You can also see what is catching my eye on Pinterest by checking out my boards and recent pins. Thanks for reading. I can't wait to share some new tutorials with you soon.